This great SuperPro Class-A Chimney from Supervent Products is normally sold only to chimney professionals , but you can get it here at Hart's Hearth! You won't find SuperPro at your local hardware or home center store. SuperPro Chimney features 304-alloy stainless steel for both its inner and outer liner. SuperPro also features mineral wool insulation. This insulation is formulated for optimum performance while dramatically reducing chemically active ingredients. Its provides a thermal delay that resists and contains surges of heat, keeping the outer liner cooler. 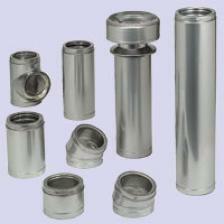 The SuperPro couplers are embossed, not cut, to reduce moisture penetration. This greatly increases the longevity of the chimney. With these features, Supervent Products is so confident in SuperPro that they offer a lifetime prorated warranty. Components, such as flashings, have a galvalume coating which has twice the corrosion resistance of galvanized steel. SuperPro features twist-lock connections; however, locking bands are recommended at each joint for extra security when cleaning and are required on elbows. SuperPro has been tested and listed to UL's 103HT Standard. The manufacturer approves its use for wood, oil, coal, and gas. 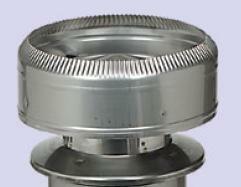 It is available in 6" and 8" (inner) diameters. When you need 7" diameter class-A chimney, you'll want to use SuperChimney Max. Mallable Flashing; 1/12 to 7/12 Pitch; Security Class-A 8"
Black Stovepipe Adaptor; SuperPro 8"
6" Chimney Length; SuperPro 8"
12" Chimney Length; SuperPro 8"
18" Chimney Length; SuperPro 8"
24" Chimney Length; SuperPro 8"
36" Chimney Length; SuperPro 8"
48" Chimney Length; SuperPro 8"
15 Degree Elbow Kit; SuperPro 8"
30 Degree Elbow Kit; SuperPro 8"
Tee with Plug; SuperPro 8"
Square Trim Collar; SuperPro 8"
Attic Insul. Shield; SuperPro 8"
Firestop Radiation Shield; SuperPro 8"
Firestop Attic Shield; SuperPro 8"
Roof Support Kit; SuperPro 8"
Roof Flashing; 0/12-6/12; SuperPro 8"
Deluxe Rain Cap; SuperPro 8"
Withstands heat up to 1200 degrees F.